Hubby and I have been waiting for this day since we bought our pad in London, we are at long last on the map of the underground. See that imaginary dot between Silver Street and White Hart Lane, yep, that’s us, just a short walk away from either station. 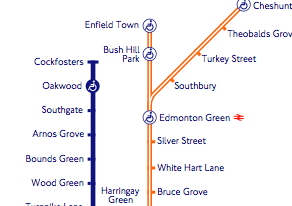 What was Greater Anglia is now London Overground with an improved service and most importantly our very own station(s) on the Underground Map. Baking at home – Krentenbollen, The book of Buns, Jane Mason.